As the end of World War II approached, over 500 Victory ships were built in American shipyards as replacements for the slower and less nimble Liberty ships. The very first one completed, the S. S. United Victory, was built by Kaiser’s Oregon Shipbuilding Corporation near Portland. It was delivered on February 28, 1944 (exactly one month after the last Liberty ship was launched in Portland). 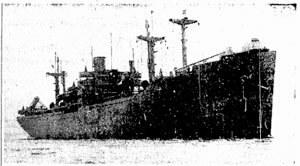 The S. S. United Victory, first of the nation’s fleet of turbine-propelled merchant ships to succeed the slower and less graceful Liberty type, graduated with high grades and praises in its final examination during its trial run from Oregon Shipbuilding corporation to Astoria and return, according to a maritime commission-approved newspaper release Monday. Ultimately the Oregon Shipbuilding Corporation built 37 Liberty-type ships. The S.S. United Liberty served in the South Pacific. Her crew was credited with shooting down three enemy bombers despite the ship having been pierced by several shells from a Japanese gunboat. But the S. S. United Victory met here demise on April 16, 1945 near Okinowa, Japan. Fortunately there were no human casualties.